Jeanne Adwani is co-founder and Creatrix of Evenstar's Chalice. 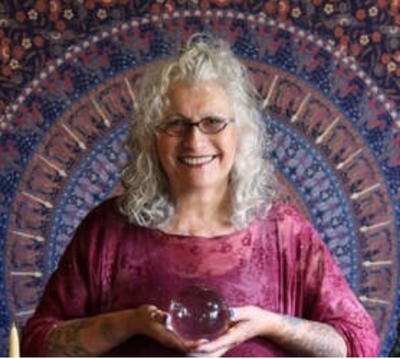 She's an artist/creatrix, a poet, a Creativity Coach, an energy worker, a hair ‘healer’, and a Sister of the 13 Moon Mystery School. She owns Be Hair Now, and co-creates the beautiful experience of Evenstar’s Chalice in downtown Ypsilanti, MI. Jeanne holds to the wisdom that when we celebrate ourselves in the witness of community, we ground Love, Grace and Joy in an active radiance. This radiance lights the way of love for others to engage in, and to feel the support that being held and 'seen' tenderly in our communities, reflects support to the greater collective, to The One Heart. To contact Jeanne to inquire about availability for services on particular dates and/or about her rates, please use this contact form and enter "Inquiry for Celebrant Jeanne Adwani" in the comments field along with information about your event and target dates. Jeanne will respond to your inquiry promptly.